What is different about this cabinet? Do I really need this? If you crave a little more office organization or if you see that you have a surplus of stuff sitting around your work area, then yes! Organize, store, and lock it all away with the Slide Out Office Storage Cabinet! This spacious cabinet holds all of your office items, and locks, giving you a secure storage solution that helps you work better. What's the difference between right side and left side of desk placements? To ensure that you purchase a storage cabinet that opens on the correct side of your workstation, we ask you to choose a left of desk or right of desk option. The drawer has a panel on the back that only opens on one side, so the orientation of the drawer cannot be changed. In addition, due to the size and weight of the pre-assembled Slide Out Office Storage Cabinet, it must ship freight, and we want to make sure you're getting the right cabinet, so it's important that you consider your cabinet's placement before you place your order. If you have any questions at all, reach out to our Support Team and we can help! Does this come in any other colors besides black? Yes, we designed this cabinet in white and black color options. Match yours to your workstation! How secure is this? Does it lock? We designed this slide-out cabinet to provide more storage and security to workspaces everywhere. The slide-out drawer locks, giving you a secure, roomy storage solution when and where you need it. You'd be surprised how much storage space you add to your immediate work area when you introduce the Slide Out Office Storage Cabinet. Small, medium, and large office items will easily fit inside this beast of a cabinet. Keep your purse safe, or store sensitive work materials with ease. 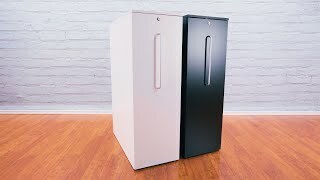 The Slide Out Office Storage Cabinet is available in both white and black. Storage doesn't have to be boring with a cabinet that matches your UPLIFT Desk. From the tried and true office staple of black furniture to the more modern appeal of white office furniture, color choice has been made simple with the Slide Out Office Storage Cabinet. Choose either left or right facing drawers for the Slide Out Office Storage Cabinet. The direction the drawers of the storage cabinet face cannot be changed, therefore it is important to visualize where the cabinet will be setup to optimize its functionality. Contact our team at 1-800-349-3839 if you need help deciding which setup will work for your space. This product comes standard with a 3-year limited warranty. For more information on UPLIFT warranty coverage, click here.